Congratulations to the winners of both courses, Olivia Coman and Lynn Smith on the short, Keith Yardley and Rob Hickling on the long. To kick off 2018 Grampian Orienteers are proud to present the antidote to Christmas board games. Are you fed up of never getting that triple word score? Tired of being beaten to the finish in Trivial Pursuit? Come along to Tyrebagger and blow away those winter blues with a magnificent game of Mon-O-poly Mon-O-poly instructions. Registration and starts between 10.30am and 11am. Parking at the 2nd car park off the A96. Streetmap. Entry fee £4/£2. This will be a score event with a 45 minute time limit. Estimated course lengths: long 4.2km, short 2.4km. Afterwards head to Inverurie (Stuart and Helen’s) to fling open the Gramp ‘community chest’ for soup, buffet and prize-giving. A straightforward event at Hazlehead: just one unmapped abandoned tent between two points – not quite as exciting as the naturist sunbathing in the dunes at Balmedie last year. Olivia had brisk trade at her cake stall, not surprising as we were spoilt for choice and my choice was delicious. Some new faces and some old faces braving a chilly wind and evening golfers. Good to meet/catch up with you and hope to see some of you at Glen O’Dee next week? Details on Maroc’s website. Day 3 Tuesday 1st August Birsemore. Day 3 is ‘our’ day shared with ELO, TINTO and STAG. David Esson, Gareth and Murray have been busy planning courses and showed the team leaders around a rather chilly but scenic Birsemore on Saturday. As you know it takes a lot of manpower to make sure the event runs smoothly. It is hoped that as many Gramp members as possible will offer to help on the day, if you are not attending the event but would still like to help you will be very welcome. Help is required for parking, starts, arena (including IT), string course. Please contact Helen on sh.and’at’gmx.com with offers of help, if you have a particular preference just let me know. Lovely weather, a very twisty-turny course, lots of controls and a double-sided map caught out the unwary … well done to all those that succeeded! He quickly regained his composure sufficiently to correctly identify not only the year, the competition and the team members but also the location as being “the top end of Scolty”. His composure was shot down in tatters again tonight when presented with his prizes – a legendary GRAMP chocolate coin and a bit of GRAMP memorabilia in the shape of a rather fetching pair of red lycras, not too dissimilar to those sported by Bob in the photo. Other members present tonight were heard to mutter something about “not entering any competitions if that’s what you get”. No sense of adventure! The Grampian Orienteers’ annual dinner is once again being held at Raemoir House Hotel. The price is £26.50 for 3 courses and coffee. If you have not attended the dinner before it comes highly recommended, this is a great opportunity to meet your fellow orienteers somewhere other than a forest car park! If you have been to previous dinners then you will know it is not to be missed. If you would like to attend then please contact Helen Anderson using this form. This year you have the added bonus of a level C event at Crathes on Sunday 24th where you can burn off those extra calories. 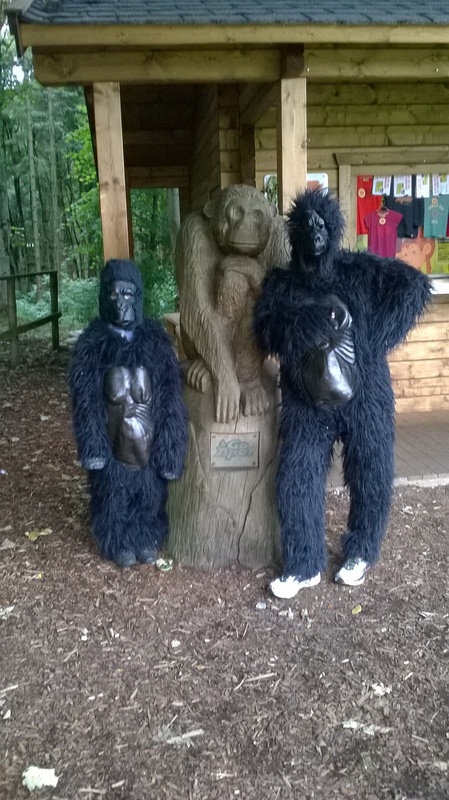 This pair of apes were spotted swinging through the canopy at Crathes this afternoon. There is a banana skin for the first person who can work out which Gramp members are in disguise. ” Thank you to all those who turned up, on what started out as quite a dreich morning, and entered into the spirit of both the event and the quiz. I tried to make it a little bit of something for everyone in terms of mixing up easy & decent orienteering as well as a mixture in the quiz questions. Well done to Jon Musgrave, Sarah Dunn and Adrian Will who were the top 3 overall and to Stuart Anderson who got the highest score on the quiz. Poor show by the McLeods and Gomersalls – who did not spot their own anagrams!